DESSERT CAME FIRST. And why wouldn’t it? Last Saturday’s beautiful weather was a perfect excuse to hop on the NY Waterway East River Ferry and explore Smorgasburg in North Williamsburg. I’d made plans to spend some time talking with Giuseppe Maione of Alchemy Creamery, and of course had to sample some of his potions. It was easy to (temporarily) ignore all of the meaty, savory aromas that is Smorgasburg and dig in to the cup of creamy sweetness that Giuseppe offered me. 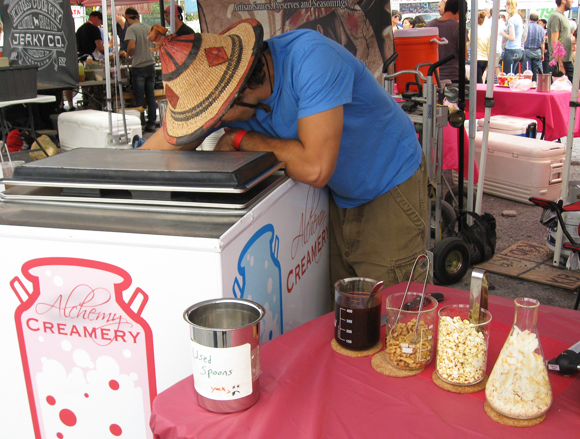 Alchemy Creamery, started in April 2012, is a small-batch, non-dairy ice cream, sold through Smorgasburg and select retail locations in New York City. All-natural coconut cream, unrefined sugars, and natural plant extracts go into the product, along with locally sourced flavorings. On Saturday, I sampled Apple Cinnamon topped with caramel sauce, along with Fixation—a dark chocolate chai. These flavors are developed, tested and produced at Organic Food Incubator in Long Island City in a leased, professional kitchen space used exclusively by Alchemy Creamery. The selections change based on season and ingredient availability. Currently 15 to 18 gallons are produced weekly by Maione and his two Alcreamist partners JD Gross and Jesse Goldman. Maione’s got the fantasy wish that he could clone himself, but until then, he considers his partners crucial to bounce ideas off of. He borrows his father’s pick-up truck to transport and deliver to Smorgasburg and retail locations. 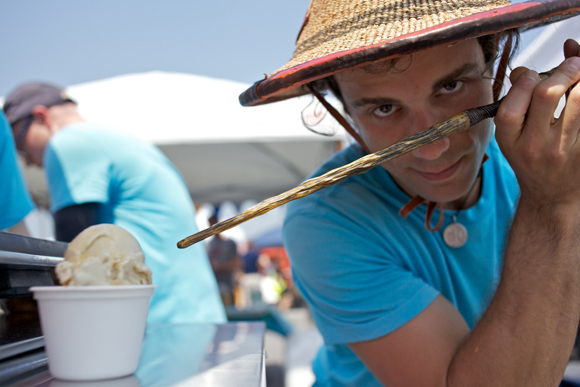 Giuseppe, 28, has found that getting to know and work with other Smorgasburg producers has helped showcase and grow his product. 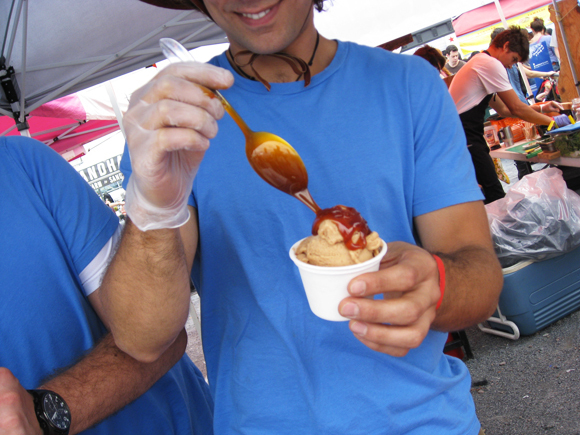 He prefers to source flavorings from his fellow vendors. The chocolate in Saturday’s Fixation came from Raaka Chocolate. Currently there are no plans for a brick and mortar storefront, as Giuseppe wants to market and sell through other sources, like Champs Family Bakery. He likes the idea of small-batch deliveries to other like-minded food stores, as well as picking up the occasional catering gig. He’d love to have a chance to create one-of-a-kind flavors for someone’s wedding. “Twitter and Instagram have been amazing marketing tools. The foodie culture is migrating to sharing what you enjoy,” says Maione. Alchemy Creamery is no casual endeavor on Giuseppe’s part. It’s an outcome of a lifetime of learning about food and restaurants from his father and the family’s restaurants. Using dependable suppliers and resources, developing aesthetics, pricing the product, working with staff and customers—Maione encountered all of this working in the family’s restaurants, where he was the head waiter for 11 years. “Food is complex and multi-layered,” says Maione. “On one hand, it’s about nutrition, but it’s also about comfort and pleasure.” And with that, Alchemy Creamery is being developed to keep health in mind (non-dairy) but also fun. One ice cream flavor, or two, is not enough. Maione experiments to create unique flavor mixes, so that one tastes one flavor at first, and then another, and perhaps yet another. Additions like caramel, or chocolate balsamic sauce, or salted walnuts—displayed in chemistry beakers—work to add texture and flavor. Giuseppe and I are colleagues at a retail store; like so many of us lately, he works part time to earn some money to fund the other interests in his life. He’s an incredibly warm, friendly person and takes pleasure when a customer smiles after tasting the flavor mixtures—potions—he crafts. At work, he’s known for bringing in tastings to the employee lounge, and we’ve gotten to taste Stone of Jupiter (a roasted red pepper chocolate chili powder ice cream) and Heart of Mars (Rooibos Red Tea). I’m waiting to taste Saturday Morning Cartoon (Fruity Pebble Tea). It won’t last long.